General Motors Europe and its union have agreed in principle on a plan that reduces working hours at all of its factories across Europe. The agreement will enable the local plants to agree on the necessary steps to adjust production capacity in the most cost-efficient and socially responsible way, GM Europe said in a statement. The next move will be for plant managers to speak with workers representatives about the reductions. Those meetings are set to take place in the coming days. The cuts are the latest step taken by the automaker to cope with a global economic slowdown that has dramatically reduced new-car sales around the world. In 2008, GM Europes unit sales fell 6.5 percent to 2.04 million units. The decline in demand was particularly severe toward the end of the year as sales were down 14.2 percent to 175,791 units in December. To cope with the declining demand, GM Europe plans to reduce employee costs in Europe this year by at least 10 percent, which would be $750 million (about 566 million euros). The automakers managers will work with the unions to find other ways and additional solutions to achieve the necessary overall cost-saving objectives. Klaus Franz, chairman of GM's European union, said: "This first European agreement with work time adjustments protects the persons employed without drastic financial disadvantages. GM has cut its European work force by about a fifth over the past four years. 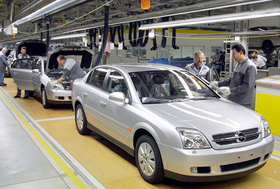 Half the 12,000 jobs cuts came at its German unit Opel, which in December 2008 was the first European automaker to seek a government bailout.